The Catholic Artists’ Society series, Art of the Beautiful, concludes on Tuesday, April 5th, at 7 PM, with a talk by conductor Manfred Honeck, music director of the Pittsburgh Symphony Orchestra. Born in Austria, Honeck has worked to great acclaim with the world’s leading orchestras, including the Berlin Philharmonic, Vienna Philharmonic and the London Symphony Orchestra. In the United States, Honeck has conducted the New York Philharmonic (with whom he is appearing next week), The Cleveland Orchestra, Chicago Symphony Orchestra, Los Angeles Philharmonic, Philadelphia Orchestra and Boston Symphony Orchestra. 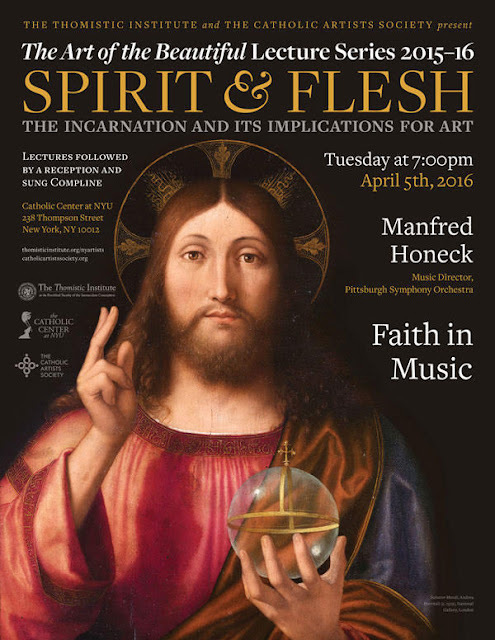 His talk is entitled “Faith in Music”; a reception and the singing of Compline will follow.